Yet another competitor of Many Eyes, Swivel, Track-n-Graph, WidGenie and the just-posted iCharts: Trendrr [trendrr.com] has the capability to track the popularity and awareness of trends across a variety of inputs, ranging from search engine results, news stories, social networks, to blog buzz and video views downloads. This means one is able to compare Amazon book ranks, with Google News results, with MySpace page views, with YouTube video views, and so on. Results include data mash-ups like the comparison of frequency of online news stories about "foreclosure" and "Britney Spears" or the number of blog posts mentioning Neal Stephenson's new book versus the Amazon Sales Rank. In an interesting twist on user interaction, users can drag multiple graphs to a "scratch pad", where they can be overlayed or put side-by-side, and compared. The full screen feature reveals advanced options such as relative/absolute change, timeline zooming and user-configurable annotations. However, one needs to be a member to embed the graphs on 3rd party sources. 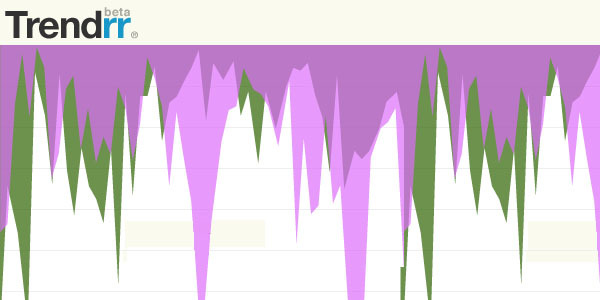 From any graph page, one can click the 'about' tab to embed it. First, I was convinced widgenie and Trendrr were somehow related, but it seems the similar web layout, and in particular the "track/compare/share" versus "plugin/create/share" is purely accidental. It is also a bit surprising how even with the seemingly rich amount of data inputs available, only a few interesting correlating graphs have been produced. Via datamining.typepad.com. You might also be interested in mycrocosm and daytum. CHIBA, Japan (AP) _ Video game rivals Sony and Microsoft are going head-to-head in virtual worlds for their home consoles later this year. Both companies announced their services, which use graphic images that represent players called "avatars," Thursday at the Tokyo Game Show. Sony Corp.'s twice delayed online "Home" virtual world for the PlayStation 3 console will be available sometime later this year, while U.S. software maker Microsoft Corp., which competes with its Xbox 360, is starting "New Xbox Experience" worldwide Nov. 19. Microsoft's service will be adapted to various nations, but people will be able to communicate with other Xbox 360 users around the world, according to the Redmond, Washington-based company. 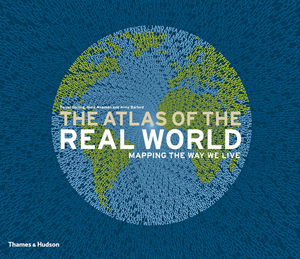 The real-time interactive computer-graphic worlds are similar to Linden Lab's "Second Life," which can be played on personal computers and has drawn millions of people. In the so-called "metaverse" in cyberspace, players manipulate digital images called "avatars" that represent themselves, engaging in relationships, social gatherings and businesses. Internet search leader Google Inc. has unveiled a similar three-dimensional software service called "Lively." Japanese companies have also set up such communities for personal computers. Ryoji Akagawa, a producer at Sony Computer Entertainment Inc., Sony's gaming unit, said 24 game designing companies will provide content for "Home." He did not give a launch date or other details. A limited test version over the summer was handy in preparing for a full-fledged service, he said. In both Sony's and Microsoft's virtual worlds, players can personalize their avatars, choosing hairstyles, facial features and clothing. Akagawa said avatars will be able to dress up like heroes in hit video games. "The Home has beautiful imagery with high quality three-dimensional graphics," he told reporters. But Hirokazu Hamamura, a game expert and head of Japanese publisher Enterbrain Inc., who was at the Sony booth, said he needs to see more to assess "Home." "You still can't tell what it's all about," he told The Associated Press, adding that "Home" may be coming a little late compared to rivals. "There are so many more possibilities for a virtual community." Schappert said Microsoft's service promises to be more varied as a gateway to various entertainment, such as watching movies, going to virtual parties and sharing your collection of photos. "Our goal is to make the Xbox experience more visual, easier to use, more fun to use and more social," he said in an interview at a nearby hotel. "We focused a lot on friends and other experiences outside just playing games." C'est la même idée qui vient et revient encore depuis 10 ans (un monde partagé en 3d, "réaliste" voire banal et quotidien, on y crée ou customize son avatar et sa maison, on y "discute", etc.). Je me demande si elle finira par prendre et décoller... ou si il s'agit simplement d'une mauvaise idée, de quelquechose qui n'intéresse pas les "users". 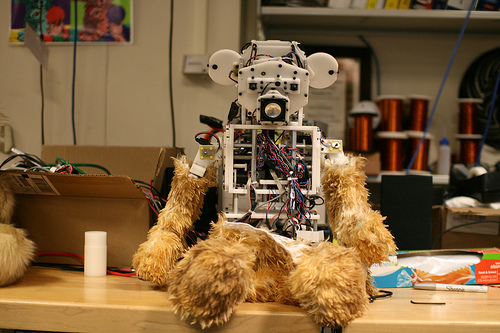 Which part of this bear encountered yesterday at MIT Medialab is close to the Uncanny Valley? The bear-head-shaped face? The way it looks down? the fur-like body parts? or the explosive body wiring? Is the furry part more uncanny than the head? Who needs Augmented Reality Cybermaid Alice? Bandai Japan plans to release a palm-size cube in the middle of next month that lets you stick your finger into it to interact with the beings and things contained in the box. 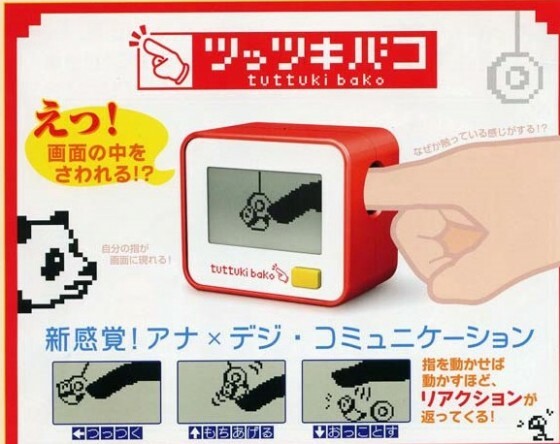 The so-called Tuttuki Bako, Tuttuki Box, features a display that shows a digital replica of your finger once you put it into the hole in the right side of the device and start moving. Users can then play with a panda bear or a small figure, explore a “virtual” lake and touch a girl’s face or a slime ball. The battery-powered box, which also doubles as a clock, is sized at just 105×120×87mm. Bandai will sell it for $30 but hasn’t said yet whether it will ever be available outside Japan as well. “In 2002 eight territories were known or suspected to have strategic nuclear weapons: the United States, Russia, France, China, the United Kingdom, Israel, India and Pakistan… The United States, which has the largest number of nuclear weapons, has 240 times more than Pakistan, which has the fewest.” *Strategic nuclear weapons, estimated total, 2002. “Each new book published is counted only once on this map, regardless of how many copies it sells… A book is defined as having at least 50 pages; a pamphlet has 5 to 49 pages. Publications with fewer than 5 pages are not shown on this map. Worldwide, about a million new book titles were published in 1999, with the largest numbers published in the United Kingdom, China and Germany. Overall, the map is dominated by Western Europe, which is home to a number of well established publishing houses.” *Books titles published, number per million people, 1999. “Just 3 million people worldwide had access to the internet [in 1990]: 73% of these were in the United States and 15% in Western Europe, with just a few in other places such as Canada, Australia, Japan, South Korea and Israel and practically no access anywhere else.” *Internet users in 1990, thousands. “The number of people using the internet saw a 200-fold increase between 1990 and 2002. By 2002 there were 631 million internet users worldwide. The distribution of users also changed radically… By 2002 there were substantial numbers of internet users also in the Asia-Pacific and Australasia, South Asia, South America, Eastern Europe and China, and small but significant numbers in Northern Africa, East and Southern Africa, and the Middle East and Central Asia.” *Internet users in 2002, users per 1,000 people, 2002. “As quantified here, forest depletion is the net rate of loss of forests as a result of tree felling that is not offset by regrowth. The loss is measured in terms of the market value of the trees in the form of untreated round timber. In other words this map shows, at the territory level, the dollar value of wood that is not sustainably harvested… Almost half of the world total (46%) occurs in India, where the annual timber depletion exceeds that of the next 25 countries combined, althought the population of India is also almost as large as the combined population of those 25 other territories.” *Forest depletion, US$ billion, 2003. “In 2002 there were an estimated 172,000 war deaths worldwide. The majority of territories recorded none; the deaths shown here occurred in only 80 of the 200 territories, and 70% of them occurred in just 9 territories. The Democratic Replublic of Congo bore the largest share of war deaths in 2002, at 26%. As a fraction of total population Burundi was hardest hit, with 1.2 people in every 1,000 dying.” *War deaths 2002, thousands of people killed in wars. “In 2002, 43% of the world’s population lived in US$2 a day or less… Where almost the entire population of a territory lives on incomes at this level, it is unsurprising if undernourishment is high, the level of education is low and life expectancy short. In both Nigeria and Mali, 9 out of every 10 people subsist on less than US$2 a day.” *Living on US$2 a day or less, millions of people. “A majority (61%) of the Japanese population live in households with daily incomes between US$50 and US$100, adjusted for purchasing power parity. North American and Western Europe are also particularly large on this map, while South Asia and Central Africa have almost completely disappeared.” *Living on over US$200 a day, % of population.